This post is sponsored by P&G. With Tide®, Downy® and Bounce®, you can keep your summer fashions looking new up to 50% longer. There is nothing more I love than doing laundry. Gathering the dirty clothes from everyone's rooms, matching all those socks, and putting it all neatly away is one of my guilty pleasures. The way my kids change their clothes multiple times a day and never seem to get their clothes in the hamper... I love every single second of it! Wait a minute, I think I was dreaming. Dirty laundry is a thorn in my side. Thank goodness my husband has taken the lead role when it comes to washing my kids sports clothes, because no matter how hard I try to "get my head in the game," laundry is a match I'm unlikely to win. That's why I like trying to try different laundry products and combinations. If there is something that will make my laundry experience just a little bit happier, I'm all for it! 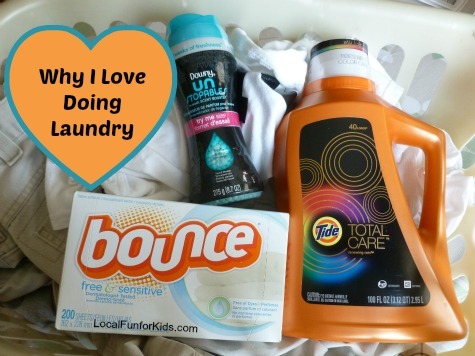 As you can tell, laundry isn't something I usually get excited about, but I was excited to try Tide Total Care, Downy Unstopables, and Bounce dryer sheets together. Many of my summer clothes are rather delicate. I'm often washing my light summer tops with my flowy skirts, and I want to make sure they maintain their vibrant colors while protecting the fabric. I like pairing solid color bottoms with a bright top in the summer. It's amazing how certain colors, like fuscia, aquamarine, and purple can lift my spirits. I also like layering a long thin camisole under my favorite shirts to add some length. I feel like they go really well together. The Tide Total Care is really nice because it's designed to help keep your clothes like new. I don't have a huge budget for clothes, so this is really important to me. Also, the Downy Unstopables really add a fantastic scent to our clothes. In the summer, it's easy to get hot an dirty while outside with the kids, so I like starting the day with clothes that smell really good. As much as I dislike laundry, there is something nice about the fresh smell of a nice clean towel or a favorite t-shirt. I stopped using liquid fabric softener a long time ago, and I really like the Bounce free & sensitive dryer sheets which don't contain any extra perfumes or dyes. I just got a new maxi-dress for the summer and Bounce does a great job of preventing static cling, which would be very annoying with a dress like this. When I use the Tide, Downy and Bounce together, I have clean and fresh smelling laundry. I also know that I'm doing everything I can to keep my family's clothes looking new and keeping their vibrant color. The Downy Unstopables are a bit of a laundry luxury for me, but I'm willing to splurge for these, because the scent really does make my laundry experience happier. What about you? Do you have any tricks or tips for making laundry time more pleasant? Leave me a comment and let me know. This post is part of a DailyBuzz MomsTastemaker program with P&G.